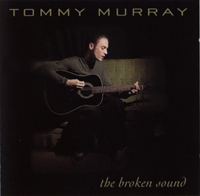 Tommy Murray is a singer-songwriter from Wilmington, Delaware who called attention to himself by stomping the floors of New England area open-mics with his passionate performances. Formerly accustomed to framing out songs for rock band format, (The Crash/Clayton bands which took him touring up and down the east coast) it was living alone for three years on a bay in Massachusetts that gave him the opportunity to sharpen his skills as a songwriter. The isolation intensified the writing; within a month, weekday open-mic performances turned into weekend feature spots and his demo "The Shadow of A Dam" began selling faster than he could make them. He signed a record contract with Pennsylvania based Creep Records and put out his freshman effort "The Broken Sound" with which he was quickly honored at Boston's famed folk club, Club Passim, in their "Cutting Edge Singer-Songwriter" Series. He's played many known folk clubs including numerous performances at The Tin Angel in Philadelphia, has opened for national acts on occasion and frequently shares the stage with countless professional songwriters whom his talent rivals. "One-Day Seminar" is Tommy's first venture into the world of acting, but not the first at acting silly. When Tommy's not signing, writing songs or acting, he spends his time being a lawyer. Download Tommy's song "One by One" as featured in the short "One-Day Seminar". You can either click directly on the link below to listen to the track directly in your browser, or right-click on the link and select "Save Target As" or "Save Link As" to save it to your computer. After earning his "singer-songwriter" badge in New England, he moved back to Delaware where it began to shine even brighter. As more and more people began coming out to see him play, he eventually was offered a spot on the roster. 7 Tracks on this EP, NICE.